Runtime 1 hr. 42 min. 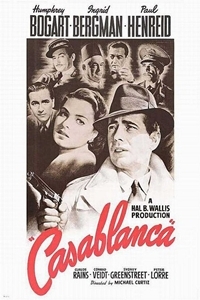 SynopsisFiftieth anniversary print (1992) of classic World War II story, starring Humphrey Bogart, Ingrid Bergman, Paul Henreid, Claude Rains et al, looks terrific in glorious black and white. A half century later, it still is a sublimely romantic, soul-satisfying experience.